What some people may not realize is that with energy-based healing, there is a lot more to it than meets the eye. If you’re someone who is skeptical about how modalities like Acupuncture actually deliver results, or have just never experienced it yourself, this article will help you understand a bit of the theory behind this ancient practice. One of the main functions of Acupuncture is to eliminate toxins from our body. What is a toxin, and how does it enter my body in the first place? Merriam-Webster defines it as: a poisonous substance that is a specific product of the metabolic activities of a living organism and is usually very unstable, notably toxic when introduced into the tissues, and typically capable of inducing antibody formation. In layman’s terms, toxins are anything from an outside source that is poisonous and detracts from our optimal health. We can’t really avoid them entirely, but there are ways to recognize their presence, and there are lifestyle changes we can make to limit/eliminate them. Step 1: Toxins enter the body. They accumulate in us from a variety of sources: medications, poor diet, lack of exercise, the environment, stress…and the list goes on. They can show up as just about anything like headaches and pain; fatigue; skin breakouts…even bad breath! (More on this here.) We can combat these symptoms by eliminating toxins. And that brings us to step number two: The Acupuncture treatment. Step 2: Points activated by needles. Hair-thin needles are inserted into trigger points on the body (these are designated points of electrical sensitivity.) This stimulates corresponding receptors in the body which begins the healing process. Step 3: Hormones & chemicals released. Prompted by the needles being inserted (and gently twisted), certain hormones and chemicals are released which can reduce pain and other unwanted symptoms, regulate the endocrine system and calm the nervous system. Step 4: Enjoy the benefits! Now that systems have been regulated and toxins have been eliminated, the patient is on their way to a much healthier self. As a result of Acupuncture, patients will notice benefits like improved breathing, circulation, and strengthened immune system; decreased pain, irritation, stress/anxiety, and fewer symptoms of illness and disease. During and following the treatment, patients also report full body relaxation and stabilized mood, due to increased serotonin levels. There is of course much more to this complex but amazing healing practice, but this should give you a more digestible understanding of the power of Acupuncture. 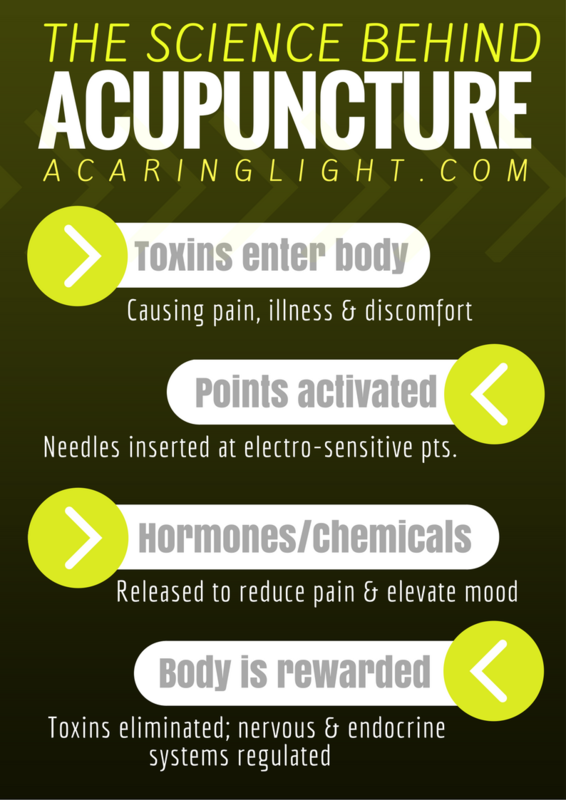 Interesting fact: Acupuncture was the catalyst for the opening of A Caring Light Natural Health Clinic. Its success treating a family member’s asthma prompted Tammy to transition from being a full time registered nurse to begin learning alternative therapies like Acupuncture. And she is still as passionate as ever about it 14 years later. If you have any questions, feel free to contact Tammy by email at acaringlight@gmail.com. Categories: Articles and Posts | Tags: acupuncture, alternative health, alternative medicine, chi, Chinese Medicine, energy, healing, moncton, natural health, natural medicine, relaxation | Permalink. Lavender is one of the most beloved and widely used essential oils. Its gentle, sweet aroma and soothing benefits make it a must-have for essential oil users far and wide. Here is a list of some of its most powerful uses. 1. Calming & relaxation. We all have anxiety inducing moments in life, and sometimes need a little help calming the nervous system. Put a couple drops of your forehead and/or inhale for calming and de-stress. 2. Minor cuts. For alleviation of pain and for a fast healing process, apply Lavender directly to cuts, It will also help clean and kill bacteria. 3. Acne & eczema. Mix with olive or massage oil and apply topically for relief from itchiness and reduce redness. 4. Improve sleep. Apply and rub in 2 drops to bottom of feet before bed for improved sleep. Inhale, and/or place a couple drops on your pillow. Sweet Lavender dreams! 5. Heal/prevent burns. Immediately upon burning, apply directly onto inflamed area to sooth and prevent blistering/redness. Thanks for stopping by to read! I hope you learned a few things, and look forward to sharing the many benefits of other Essential Oils in the future. As always, if you have any questions, or would like further information on the oils, feel free to email acaringlight@gmail.com. Don’t forget to sign up for the ACL newsletter for more info like this if you already haven’t! Categories: Articles and Posts | Tags: 'essential oils', acne, body, burns, chi, eczema, emotions, energy, heal, heal cuts, healing, health, holistic, lavender, meditation, oils, reduce stress, relaxation, sleep, spirit, wellness | Permalink. You have energy circulating in your body, the same as you have blood circulating. Good health is dependent on both. In layman’s terms I compare energy to the wind. You cannot visually see the winds, but you can see and feel its effects. Imagine the wind blowing garbage across the street. The energy circulation in your body pushes toxins (garbage/waste) out. It does this various ways: respiration, perspiration, voiding, bowel movements, etc. When your energy circulation is not functioning properly, health problems arise. Energy flows through twelve main organs, spending approximately 2 hours in each organ. It starts in your lungs at 3:00 AM, and finishes in your liver, just prior to starting the process over. The organs each have a paired organ, and if you have problems with one, most likely you’ll have a problem with the other. For example, if you have breathing problems, you may notice your breathing is worse between 3:00 and 5:00 AM as this is when the energy is going through the lungs. If there is an energy blockage there, the circulation is compromised, causing shortness of breath, which may cause you to wake up. Upon awakening, you breathe deeper or get up, thus helping your breathing. The large intestines are the lungs paired organ, so often people with breathing difficulties have problems with their bowels, example constipation. The body is not excreting enough toxins; a build-up of toxins causes an imbalance in the energy circulation. Also, if you have lung problems, you may have skin problems, as the skin is known as your third lung. Things which compromise your immune system, also compromise your energy circulation, like stress, lack of sleep, lack of exercise, poor eating habits, dehydration, etc. Many of today’s alternative health treatments deal with trying to balance your energy circulation to restore your health. If you are interested in learning more, email us at acaringlight@gmail.com or call 506-961-9905. Categories: Articles and Posts | Tags: alternative medicine, chi, energy, healing, health, holistic, meridians, natural, natural health, natural medicine, prana, qi | Permalink. Click here to subscribe to A Caring Light's monthly newsletter for helpful info and tips, special promotions and upcoming events. DIY Kombucha – An easy guide to make at home.